Will you be carrying your handbag? Do you have a purse with a long enough handle to use it as a cross-carry shoulder bag? Do not put your purse into your trunk in the parking lot of the mall. If shopping at night, park in a lighted area. Pay attention to those around you while you are in the parking lot, and in the store. When you are ready to go back to your car, have your keys in your hand. Do not wait until you are next to your car, to dig in your purse for your keys. Once you do that, you are no longer aware of your surroundings. Look around before going directly to your car. Are there people lingering in that area? If you have a ‘horn’ button on your car keys, use it to bring attention to the fact that you are in danger. If you feel that someone is following your car, just start driving to the nearest police station. If you are able, dial 911, provide your location, and a description of the vehicle following you. If you have a GPS in your vehicle, make your HOME address, be the address for your local police station. That way, no one can get your actual ‘home’ address. “Cooper’s colors: A simple systemfor situational awareness” by Richard Fairburn, trainer and experience law enforcement officer, provides more than the brief definitions listed below. Remember, Fairburn is training police officers, but the words below can be beneficial in our safety also. Think. Be Safe. In condition white, you are relaxed and unaware of what is going on around you. In condition yellow, you remain relaxed, but are aware of who and what is around you. This merely means that you are paying attention to the sights and sounds that surround you whether you are at home or moving in society. In condition orange, you have identified something of interest that may or may not prove to be a threat. Until you determine the true nature of whatever has piqued your interest, your “radar” is narrowed to concentrate on the possible threat and will remain so focused until you are satisfied no threat exists. 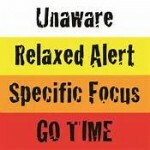 If the focus of your attention in condition orange does something you find threatening, you will shift to condition red. Notice here that condition Red IS NOT the firing stroke, as some instructors have misconstrued from Cooper’s teachings. Instead, condition red simply changes the focus of your attention from a potential threat to a potential target. If possible, in both conditions orange and red, move to a position that will give you a tactical advantage. If you are attacked in red, you should be fully prepared to defend yourself. Whether or not you have a gun in hand or on target will depend on the circumstances, but mentally, you are already ahead of the game. CONDITION YELLOW should be our main focus while we are shopping. Just be aware, not fearful, just aware! And yes, we realize that this post has not included information on concealed carry issues or ideas. But, being aware of your surroundings provides personal safety also. We at ConcealedCarryPro continue to have monthly drawings for a variety of items. To be eligible to win, just register on our website, no purchase necessary, or Like us on Facebook.